Voices told Lucas Darby to run. Voices no one else can hear. He's warned his sister not to look for him, but Rayne refuses to let her troubled brother vanish. On her desperate search, she meets Gabriel Stewart, a runaway with mysterious powers and far too many secrets. Rayne can't explain her crazy need to trust the strange yet compelling boy — even though he scares her. They discover Lucas is running from the Believers, a fanatical church secretly hunting psychic kids — gifted 'Indigo' teens feared to be the next evolution of mankind. Now Rayne's only hope is Gabe, who is haunted by an awakening power — a force darker than either of them imagine. A force that could doom them all. 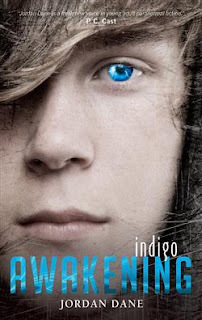 Indigo Awakening throws you straight into the action following Lucas as he runs to escape from the Believers and his sister Rayne as she desperately tries to find him. I really enjoyed the intriguing story line but found that the constant changing between many different points of view made it feel disjointed and hard to follow at times. Although it was interesting to see the story from the 'bad guys' side and it help build suspense. Even though there was a large number of main characters I found them to be well written and easy to relate to, it was hard not to feel for them as their worlds were turned upside down. A fast paced, action packed and suspenseful read, Indigo Awakening is a great young adult paranormal read and I look forward to the next one in the series. Just a quick note to wish you all the best for the New Year. I hope it is filled with loads of lovely books! Last year I did not quite reach my goal of reading 40 books so I am choosing a more conservative goal this year of a mere 25. I hope you all had better luck with your reading challenges than I did!